Finding a moment to reset during your busy day can be difficult but by practicing and adopting a simple breathing space techniques, you can learn to develop your awareness simply and quickly. 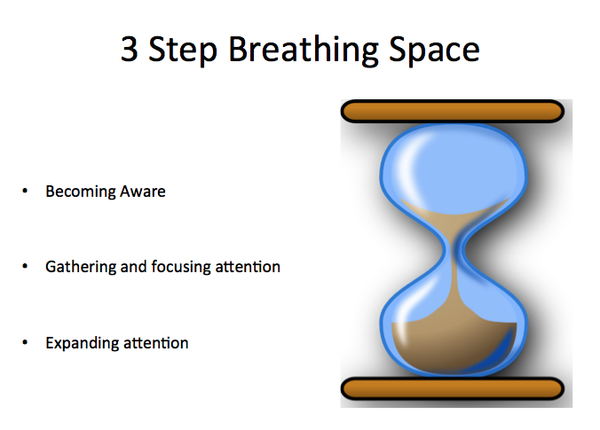 The three step breathing space was developed as part of the 8 week Mindfulness Based Stress Reduction course, (MBSR), and is a simple yet very effective technique to use as part of you daily mindfulness practice. It uses the visual of an hourglass to support understanding. The three stages being – acknowledgement, gathering and expanding through awareness and noticing. Simply stopping whatever you are doing and allowing a state of ‘being’ by asking yourself, ‘What’s happening for me right now? ;’ or ‘What’s going on with me right now, in this moment?’ I call this checking in! Become still wherever you are – either lying, sitting or standing, choose a posture where you will be as comfortable as possible, then lightly close your eyes or lower you gaze. Shift your position slightly to become aware of your feet on the floor, the feel of your body in contact with the chair. Allow your weight to sink into the points of contact between the body and the floor, chair or bed, whether that’s your feet, arms, your buttocks or your back. Become aware of the gentle shift from doing or thinking to just noticing and focusing on what ever is happening for you in this moment. You may even become aware of any sounds, or lack of sounds to help you settle into the moment. What sensations are there, right now? If you notice any tension or resistance towards painful or unpleasant sensations, gently turn towards them. Accept them as best you can. Do not try to change them or control them but just simply let them be, as they are. In your own time, take your awareness from one part of your body to the next, exploring with a kindly curiosity and just noticing what is there, what you feel. Now, start by bringing your awareness to the breath – becoming aware of the fact that you are breathing. Letting the breath breathe itself without trying to change it in any way. Just feeling the sensations of the breath as it enters and leaves your body. Being aware of a gentle rising on the in-breath, and a falling on the out-breath. Drop your awareness inside the breath and feel the different sensations in the front, back and sides of the body, inside the body and on the surface of the body. Feel all the different sensations of the breath as it flows into and out of the body. Can you rest within the flow of the breath? Use the breath to anchor your awareness in the present moment and the body. Gently broaden and expand your awareness to include the whole body. Feel the weight and shape of the body as it sits, lies or stands. Feel the breath in the whole body. Imagine you are breathing in and out in all directions: almost breathing out to the edges of your skin. Now broaden your awareness even further to become aware of sounds both inside and outside of the room. Be aware of other people around you or the spaces in the room. Now gently open your eyes and move the body. As you re-engage with the activities of your day, see if you can carry with you the awareness that you’ve cultivated.